During the last decades there has been a change towards mechanization and homogenization of farming, which uses pesticides, additives, herbicides, synthetic fertilizers and mass-production techniques. All this is clearly affecting mankind’s health, and new diseases are spreading rapidly amongst humans and animals (bird’s flu being the most recent one). You will have no additives in your vegetables. Research by organic food associations has shown that additives in our food can cause heart diseases, osteoporosis, migraines and hyperactivity. There will be no pesticides or synthetic fertilizers used. These chemical products are applied to obtain crops all the time regardless plagues or weather conditions, and affect the quality of the vegetables. Besides, pesticides are usually poisonous to humans. Your vegetables will not be genetically modified (GM). Antibiotics, drugs and hormones are used on vegetables to grow more and larger ones. One of the consequences of this practice are vegetables which look all the same and are usually tasteless. Besides, we end up consuming the hormones that have been used on the vegetables, with the potential risks for our health. 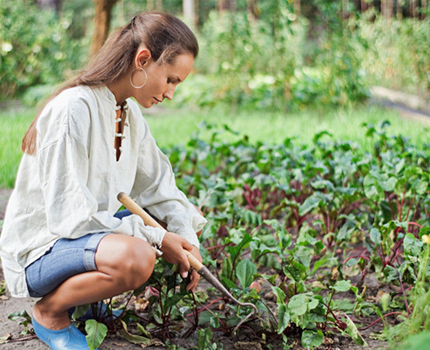 Eating your own organic vegetables will be much more healthy for you. They will not contain any of the products or chemicals named above, and they will be much more natural than any ones you would find at the supermarket. Your health will not be at risk because you will then know that nothing has been added to your vegetables. Your own organic vegetables will be much more tasty. The use of pesticides, synthetic fertilizers, hormones and antibiotics make vegetables grow unnaturally and take the taste away from them. With organic vegetables, your cooking will be enhanced as their flavour will show fully. Organic farming is friendly to the environment. Because you won’t use pesticides or other equally harming products on your vegetables, you will not damage the soil or the air with the chemical components. When you grow your own organic vegetables you are contributing to your own self-sustainability and the sustainability of the planet. Small communities have been founded where members exchange products that they grow naturally, thus contributing to create a friendly and better place for us all.